The Authorization Code Grant is an OIDC-compliant authentication and authorization flow. It implements strong end user authentication, and is used when an application needs to access resources owned by an end user. This manual describes how to acquire access tokens using the Authorization Code Grant, and shows how the token can be used to call an OP API. On this page, you will also find information on how to use the grant in our sandbox. Currently, this flow applies to Accounts V3.0. Other APIs (e.g. PSD2 APIs) will specify their required flows in their API documentation. Production & sandbox: A registered application on OP Developer, along with a client ID and client secret ("App API key" and "App API secret", respectively). Production & sandbox: At least one redirect URI for the application has been registered on OP Developer (Not required when using static tokens). Production: A registered JWKS endpoint for supplying public keys to the auth server (mocked with static keys in sandbox). Full instructions on implementing the JWKS endpoint will be provided when negotiation production access. If you are only interested in mock authentication with static authorization tokens, take any of the tokens listed in the next section and jump over to part 5. To help developers in different stages of development, we support two methods for simulating authentication and authorization in our sandbox. 2. Full mock flow The authorization code grant flow, as described in this manual: from JWT requests to authentication and authorization UI, to using access and refresh tokens for calling the sandbox API. Next, we'll explain how to complete the authorization flow. First, construct a JWT request. The JWT must be signed with a private key using RS256. In production, you must have registered a JWKS endpoint so that your signature can be verified. In sandbox, use our static keyset for signing. jwt.io provides a wonderful UI for creating test JWTs, and lists common libraries to help with JWTs. A JWT consists of three parts: a header, a payload, and a signature. Below is a sample header and payload, which you can use as a starting point when constructing your JWT. aud string Identifies the intended audience of the JWT, i.e. the OP authentication and authorization service. Set to op_open_oauth . scope string Requested scopes as a space-delimited list of scope identifiers. These define the level of access that the client app requests to the end user's data. The openid scope is required in all requests. The scopes for Accounts V3.0 are accounts (account list and basic information) and accounts:transactions (transaction list). iss string Issuer of the JWT request. This field contains the client ID, which is equivalent to APP_API_KEY obtained from OP Developer. response_type string Identifies the auth flow type. The only allowed value is "code", indicating the access code flow. redirect_uri string The URI to which the authorization service will redirect the user after authentication. This must be an absolute URL, and must be an exact match with a redirect URI that has been registered for your application. state string A string value that will later be returned to the client as a query parameter. Allows the client to compare and validate the request and response. iat Date/timestamp The time at which the token was issued. UNIX time stamp (in seconds). exp Date/timestamp Expiration time: The JWT must not be accepted for processing after this time stamp. nonce string Optional . A string used for correlating an ID token with a client session. If used, it must be included both in the payload and as a query parameter. client_id string Client ID of the TPP application. This is the APP_API_KEY received from OP Developer. Append the Base64Url-encoded body string to the Base64Url-encoded header, using a dot as a separator. Copy the resulting string and sign it with your client secret using RS256 and our fixed keyset. This is your signature. Append the signature to the string you created in step 3, using another dot as a separator. At this point, you have a complete, signed JSON Web Token. For more information, see the JWT spec. 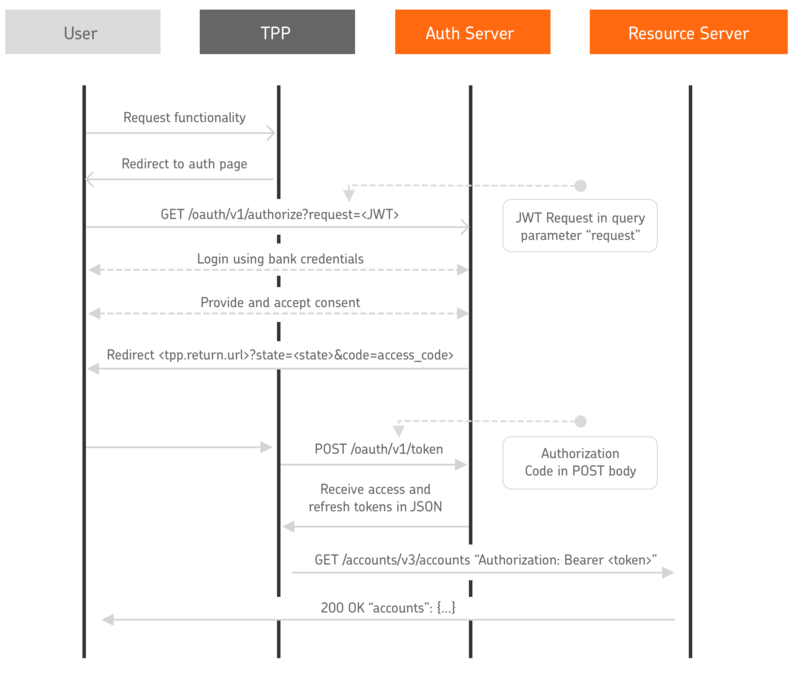 Authentication and authorization take place between the auth server and the end user. This section explains how to take the user to authentication. In addition, if you use the nonce parameter in the payload, it must be included in the query as well. Remember that nonce is not required, but if it is used, it must be present in both the JWT payload and the query. You may include the iat and exp fields as query parameters. They must match with the values given in the JWT request, or the request will fail. The authentication server redirects the user to a login page. After this, the user sees the details of the authorization being requested, e.g. scope and the resources involved. The user will be able to view, modify, or reject the authorization. Upon successful authorization, the OAuth service redirects the client to the URL supplied in the redirect_uri parameter of the JWT request. You must have registered at least one redirect URI for your application, and the redirect URI supplied in the request must match one of these registered URIs. The state parameter will contain the value originally submitted in the state field of the JWT request. The error parameter will describe the error, allowing you to communicate the source of the error to the end user. For example, if the end user interrupts the authorization process, the error descriptor will contain the message access_denied. server_error There was an error in the backend. invalid_request The request is faulty or malformed. Ensure that the values in the JWT request and query match, and that the redirect uri matches with that which you have registered on OP Developer. access_denied The user has terminated the authorization process. In this step, the TPP uses the freshly-received authorization code to request access and refresh tokens, as shown below. The TPP application must present a valid client ID and client secret when requesting tokens. These credentials must be provided in the request body. Bear in mind that client_id is your app's API key, and client_secret your app's API secret. access_token string The access token. Note that the string had no fixed length and may be long. refresh_token string Refresh token for requesting additional access tokens. Has no fixed length and be quite long. scope array Array of strings that define the scopes of the access token. id_token string Token string containing information about the user. token_type string Defines the type of the token. Always gets the value Bearer . expires_in integer The number of seconds after which this token expires. In general, errors will adhere to the recommendations of the OIDC spec. To use the access token and request resources with it from an API, supply the token in the Authorization header. The value of the header must be Bearer <access_token>. See cURL example below for a demonstration. Make sure you fulfill any other criteria for access set by the API product. In addition to supplying the access token and API key, please ensure that you fulfill any additional requirements set by the API you intend to use. aud string Intended audience of the ID token. This is the Client ID of your application. sub string A unique ID for the end user that the token describes. iss string Issuer of the token. This contains the OIDC domain of the TPP application. exp timestamp Timestamp representing the time of expiry of the ID token. iat string Timestamp representing the time the ID token was issued.